Anybody can sell themselves as a house cleaner, but it’s the businesses that use professional forms who get the best jobs – the ones who pay the most, allowing you to work in the nice homes in nice areas of your city. This allows you to quote jobs and provide your prospects with information about your business. In addition, using the right business forms allow you to run your business efficiently with room on the forms to record the information that will allow you to raise a customer’s price and justify it, know exactly how to train new workers in your client homes, handle customer issues timely and wisely, and retain the necessary records for tax reporting. 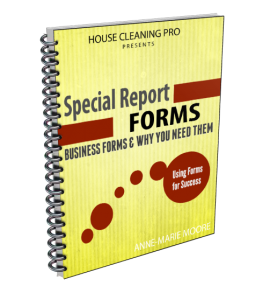 This is one of the most important reports because it takes you step-by-step through the process of using the forms to turn your prospect into a new customer. Review the process and you’ll understand why they are so important to your success. What to include on your checklist on every appointment to keep your job! 3 reasons to use a checklist – it’s not what you think!